Bovada has only been in business since 2011, but their sister site, Bodog, has been in business for more than 20 years. With a management team that has experience as long as the online casino industry has existed, it is clear that Bovada knows what it is doing. With that being said, the site has recently come under a bit of fire due to their losing their license from the Kahnawake Gaming Commission. Top choice for all US players. Live blackjack from VIG offered. In the wake of this, there have been many players who have avoided Bovada due to the lack of player protections that exist. In other words, without a valid license from a regulated gaming commission, Bovada can do whatever it wants without fear of recourse. Of course, with that being said, Bovada has a solid track record and is generally held in good regard amongst players. Regardless, their lack of a license is not something that should be taken lightly. A player should always do their due diligence in order to ensure that they trust the site at which they are playing. Bovada is, by far, the most popular live blackjack casino for North American players. Employing the services of Visionary iGaming—one of the best live dealer software providers around—helps Bovada ensure a top-notch player experience. Compared to any other live dealer blackjack offering, most fail to offer the sheer number of games and such large betting ranges. As far as the gameplay itself, varying camera angles allow for a unique experience that is not as plain as what you will find elsewhere. Prior to each hand being dealt, players are prompted to make bets via the sleek user interface. Dealers then prompt players when bets are no longer being taken, at which point the camera angle changes to a picture-in-picture screen where the cards on the table are shown on the main screen while the dealer and rest of the table are shown in the smaller screen in the upper right-hand corner. The gameplay changes with the versions of blackjack you choose to play, and your traditional version of the game features a single gameplay screen where the dealer, table, and all playing positions are visible at once. Your cards, though sitting on the table, are also digitally displayed in the bottom corner of the playing screen. As for the dealers, they are all friendly and attractive. You will be greeted the second you choose a table and the dealer will interact with you throughout the game. If you have any questions or are simply trying to flirt with an attractive dealer, you will be able to interact with the dealer just as you would on the floor of an actual casino. All things considered, there is little to complain about when it comes to both the gameplay and dealer experiences. One of the blackjack varieties you will find at Bovada that you simply do not find at most other casinos is known as Blackjack Early Payout. With an expected average return of 99.50% and a Basic Strategy software, this game is often one of the most crowded versions of blackjack at Bovada. The Basic Strategy feature consists of nothing more than highlighted prompts that, quite literally, tell players what the best, most intelligent move to make in any situation is. Blackjack Early Payout is unique because, every time you are given a new card (and do not bust), you are offered the chance to be paid out early. The size of the payout will depend both on the size of the table in terms of bet range and the strength of your cards versus the dealer’s. This particular game has no player limit and is available with the following bet ranges: $5-$100, $25-$1,000, and $100-$2,500. In terms of funding an account at Bovada, there are three different options available to you. 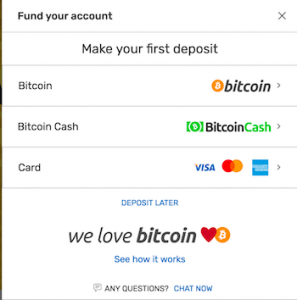 First and foremost, two of the three options are cryptocurrencies, Bitcoin and Bitcoin Cash. This is increasingly becoming a common theme and allows players to incur small fees while also offering small minimum and large maximum deposit amounts. At Bovada, Bitcoin deposits can be as small as $10 and as large as $5,000. The withdrawal minimum is the same, while the maximum Bitcoin withdrawal is a staggering $9,500. Though fees vary depending upon the wallet/exchange you decide to employ, Bovada attests that most fees are 1% or small, which is much smaller than your average credit card deposit fee. When it comes to credit card deposits, the minimum available deposit amount is $20, while the maximum is only $1,500. What’s more, while Bitcoin fees usually sit at 1% or less, credit card fees are more than 5% and can range as high as 9% and beyond. On top of that, some card companies and banks charge fees for currency conversion, so you might end up paying even more than the 5%-9%+ mentioned above. Another withdrawal option is to receive a check by courier (in the mail). With this option, you must withdraw at least $100 and are allowed to withdraw a maximum of $3,000 every seven days. Bitcoin withdrawals, on the other hand, can be executed once every three days. The mobile live dealer blackjack interface brought by Bovada and Visionary iGaming is none too different than what you will get from a desktop or laptop computer. Being that live dealer blackjack is available to both Android and iOS users, there are few devices out there that will be unable to support the live dealer games. In our experience, it is superior to play live dealer blackjack on a tablet or large smartphone, but the games will work just as fine on a small smartphone as they will on a larger tablet. The biggest and most obvious reason one would choose Bovada live dealer blackjack over other live dealer providers is the fact that they have more experience than most other sites, especially when it comes to serving a North American audience.